Presenting more than 150 never-before-published photographs of the campaign, many taken by the soldiers themselves, together with unpublished written material from British, Anzac, French, and Turkish sources, including eyewitness accounts of the landings, this is an unrivaled account of what really happened at Gallipoli. Van Emden's gripping narrative and lucid analysis of Churchill's infamous operation complements Stephen Chambers's evocative images, showing how the rapid spread of diseases like dysentery, the lack of clean water and food, and the tremendous losses on both sides affected morale, until finally in January 1916, in what were the best-laid plans of the entire disastrous campaign, the Allies successfully fooled the Turkish forces and evacuated their troops from the peninsula with no additional casualties. 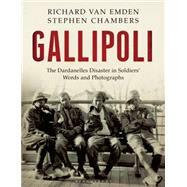 Here, leading First World War historian Richard van Emden and Gallipoli expert Stephen Chambers have produced an entirely fresh, personal, and illuminating study of one of the Great War's most catastrophic events. Richard van Emden has interviewed more than 270 veterans of the Great War and has written sixteen books on the subject, including The Trench and The Last Fighting Tommy. He has also worked on more than a dozen television programs on the First World War, including Prisoners of the Kaiser, Veterans, Britain's Last Tommies, the award-winning Roses of No Man's Land, Britain's Boy Soldiers, A Poem for Harry, War Horse: The Real Story, Teenage Tommies with Fergal Keane, and most recently, Tommy's War. He lives in London. Stephen Chambers has written three battlefield guides: Gully Ravine, Anzac: The Landing, and, most recently Suvla: August Offensive. He is a military historian and a well-known tour guide to the battlefields.